Gleeps, I finally got to go to the place where I'd dreamed of going since childhood--Westchester County, New York. I have LONG wanted to visit the area where my favorite childhood book character, Trixie Belden, grew up. (actually, when I was a child I wanted to MEET Trixie, but now that I'm an adult I realize that I'll have to settle for the place that inspired the setting for Crabapple Farm.) The Scenery was beautiful, the food was great, and of course I got to meet with alot of very interesting (and slightly obsessed)Trixie fans! Don't worry, there will be lots of pictures. Like I said, there are LOTS of pictures so please be patient while they load. Misty kindly E-mailed me a few of the names I had forgotten! (call it a "Diana moment" on my part) If you see any other mistakes please let me know. 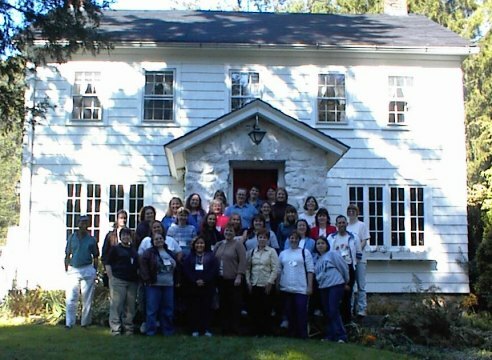 The focal point of this Convention was the property that Julie Campbell Tatham owned back when she wrote the first six books of the Trixie Belden Series. This house was the inspiration for Crabapple Farm. Here is the Whole group in front of "Crabapple Farm." This convention was made possible by the hard work and dedication of many people on Zap's Trixie Belden Message Board who were determined to put a Trixie Belden Convention together. Thank you to all those behind-the-scenes people who made it possible!! Thank you Zap for hosting the Trixie Belden Message Board and for bringing this Trixie Belden Community together. And THANK YOU Annette, who chaired this first convention and who could have given up early in the game but worked seemingly endlessly to keep this effort on track. Thank you for not giving up when it seemed that there was not enough interest in the project. I Emailed you with problems and questions and you were always helpful and kept me updated on details. The First Annual Trixie Belden Convention (can I call it that?!) was a success! !